Moon style desktop clock is a beautiful decorative piece and completely touch of nautical flair. The clock ball is 2inch in diameter. We use high quality raw material such as japanese movement. This Brown Analog Table Clock is made of fine craftsmanship. It provides a simple, elegant look to the table and always makes your time look good.This eleclock is also an ideal & thoughtful gift on any occasion. Clock trophy brass antique 02x05 inch size. This clock is beautifully designed by the experts and designers, who put all their efforts in giving perfect finish to it. Our esteemed clients can avail the product at affordable prices. The design of the clock is highly unique. The clock stands upright on a stand, which is made from supreme quality material with smooth and clean finish. The timeless piece of art, this antique clock is a collector's item - must for the connoisseurs of antiquity. These wall clocks are a bold statement to enhance the worth of a blank wall face. We are the leading trader and supplier engaged in providing the widest range of wall clocks to a large number of clients in international market. Finish: Pewter and Antique Brass. 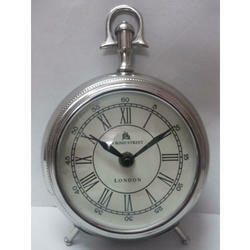 We are engaged in offering genuine quality Antique Table Clock to the customers, as per their specific requirements. In addition to this, we make available these table clocks to the clients in different designs, shapes, sizes and other specifications. Antique Brass Desk Clocks is made of solid brass. This nautical themed clock stands on three legs and has a locking gimbal for viewing at any angle. The base of this desk piece can be engraved with names and dates, or for use as a presentation gift or award. We can even engrave a corporate logo. We are engaged in offering a quality approved range of Table Clocks. We are manufacturer and exporter high quality of table clock, decorative table clock and brass table clock.